An Ethiopian Airlines plane enroute to Nairobi from Addis Ababa crashed on Sunday morning immediately after takeoff killing all 157 people on board including eight crew. The airline released a statement saying the crash happened six minutes after the new Boeing 737 Max-8 took off from the Ethiopian capital to Nairobi. It said a total of 35 nationalities were onboard including a UN passport holder. 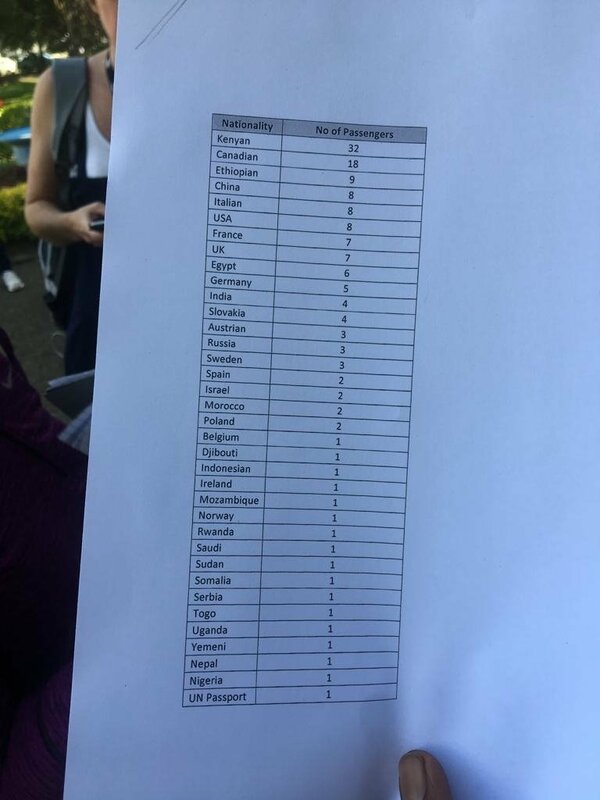 32 Kenyans, 18 Canadians, nine Ethiopians, eight Chinese, eight Americans and seven British nationals were among the passengers. The cause of the disaster is not yet known but air traffic monitor Flightradar24 reported that the plane’s “vertical speed was unstable after take-off,” cites the BBC. The airline also said the pilot had reported difficulties and had asked to return to Addis Ababa before the plane crashed around the town of Bishoftu, which is 60km (37 miles) south-east of the capital. “At this stage, we cannot rule out anything. We cannot also attribute the cause to anything because we will have to comply with the international regulation to wait for the investigation,” said Ethiopian Airlines CEO Tewolde Gebremariam during a press conference at the Bole International Airport in Addis Ababa. The Ethiopian Prime Minister Abiy Ahmed visited the accident site and called for a “full and timely investigation and communication of the cause” of the crash. Thousands of messages of condolence from all over the world have been sent to the families of the victims who have been given emergency lines to reach a passenger information center. Here are some reactions from around the world after the plane crash. I am very saddened by the news of the crash of an Ethiopian Airline aircraft today. This is so tragic! I send condolences to the families & loved ones of the victims of this terrible accident. May we all pray for them in this very difficult time. Africa mourns! The world mourns! My heart goes out to all who lost their lives in the #EthiopianAirlineCrash shortly after take-off from #AddisAbaba. It’s indeed a sad day as I was on board another #EthiopianAirlines flight on my way home to Zimbabwe. May the Almighty comfort the families & grant ease. Aameen. I have, with sadness, received news about the crash of the Ethiopian Airlines flight which was destined for Nairobi from Addis Ababa. On Uganda’s behalf, I send heartfelt prayers and condolences to all those affected by this tragedy. I wish to convey my deepest condolences and solidarity to #EthiopianAirlines and the families of those that have lost their loved ones on flight ET 302/10 that crashed earlier today enroute to #Nairobi. Our thoughts and prayers are with you. 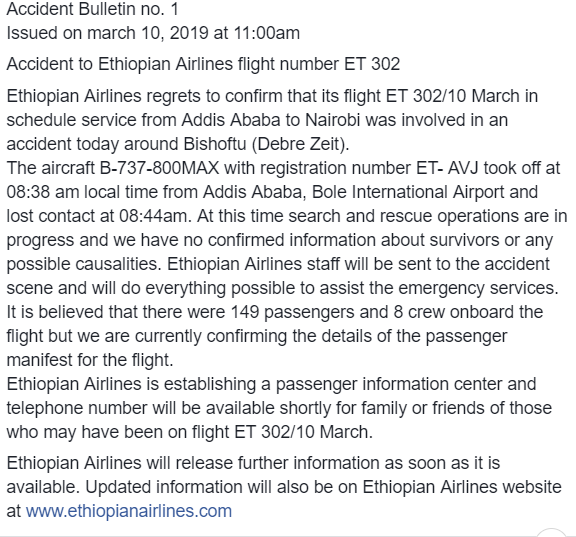 Ethiopian prime minister’s office says Ethiopian Airlines flight has crashed on way to Nairobi, none of the 157 people on board survived. Please pray for the families of the 157 people, including 8 Americans, who lost their lives on the Ethiopian Airlines flight. May God grant them strength during this horrible tragedy.